Khieu Samphan, left, turns 80 in July this year. Nuon Chea, right, the chief ideologue of the regime, is 85 and has high blood pressure and eye problems. A top legal official for the Khmer Rouge tribunal said on Thursday he expects some delays in the court’s upcoming trial of former leaders, whose age, health and unwillingness to talk in court could drag down the proceedings. 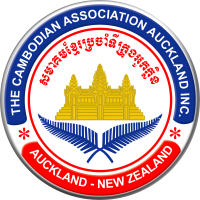 Speaking to a forum of civil party complainants in the upcoming trial, Cambodian prosecutor Chan Darareasmei said the aging leaders “will not cooperate” with the court and will refuse to speak out. “It will create more difficulties and delays,” he said. 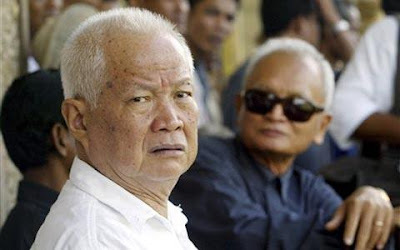 The tribunal is set to try four leaders—Nuon Chea, Khieu Samphan, Ieng Sary and Ieng Thirith—for atrocity crimes including genocide. Defense lawyers have already requested shorter days for hearings, claiming the defendants are old and cannot sit through full days. Tribunal judges have already decided the hearings will be full days. Nuon Chea, the chief ideologue of the regime, is 85 and has high blood pressure and eye problems. Ieng Sary, the former foreign minister of the regime, is now 86 and suffers from heart problems and other ailments. Khieu Samphan turns 80 in July, and Ieng Thirith will turn 79 this year. Chan Darareasmei said Thursday the case against them would be complicated and take more time than the court’s first trial, for torture chief Duch, who was cooperative. That case alone took seven months. Latt Ky, a tribunal monitor for the rights group Adhoc, agreed, saying the tribunal will have to pay attention to the health of the defendants and the timeframe or the hearings.